LUXURY - PERCEPTION AND REALITY It will take place at 7pm followed by a drinks reception from 8pm until 9.30pm held at Pewterers Hall, Oat Lane, London, EC2V 7DE. 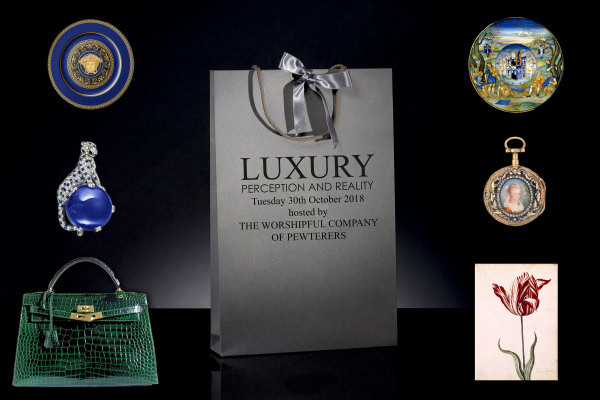 Continuing the ‘Perception and Reality’ series this lecture will explore the birth and evolution of luxury. Tracing the evolution from necessary consumption to avid consumerism from an introduction to the ‘Silk road’ effect on import and exports to today’s luxury market. The talk will explore the phenomenon of the Lipstick Effect which was first recognised during the Great Depression when cosmetic sales increased by 25%, despite the convulsing economy. Comparisons of past luxury trends will also be explored, significantly the Tulip craze of the early 17thc when, at its peak, 40 tulip bulbs were sold for 100,000 florins (approximately £1,100,000 in today’s money). However, is it so different to the current handbag craze where a Hermes Crocodile Birkin can retail for over £100,000? Examples of the earliest Gucci bags will be shown and the audience will have a chance to experience the perfume dubbed ‘the most expensive in the world’.